HD Road King Special | Throttle Life! Swapping chrome for black and powered by the muscular Milwaukee-Eight™ 107 engine, the new Road King Special motorcycle pushes Harley-Davidson’s touring line in a dramatic new styling direction, expressing a contemporary perspective on the classic Road King model. More Power Each Milwaukee-Eight engine produces 10 percent more torque than the engine it replaces in touring models. In addition to increased displacement, the Milwaukee-Eight engine features a higher compression ratio and four-valve cylinder heads with 50 percent more intake and exhaust flow capacity. The valve train requires no adjustment as the design of the rocker arms enables valve lash to be set at the factory for life. Dual spark plugs for each cylinder contribute to more-efficient combustion. A single chain-driven camshaft is lighter, mechanically less complex and creates less friction and noise. Quicker Acceleration The Milwaukee-Eight engine weighs the same as the engines it replaces, so its extra power contributes directly to improved acceleration performance. The Milwaukee-Eight 107 accelerates 11 percent quicker from 0-60 mph, equal to a two-to-three bike length improvement, and 11 percent quicker from 60-80 mph in top gear, equal to a one-to-two bike length improvement, compared to the Twin Cam High Output 103. Heat Management The Milwaukee-Eight engine offers improved rider and passenger thermal comfort due to reduced heat absorption, increased heat rejection and a redesigned exhaust system. The Milwaukee-Eight 107 engine features a precision cooling strategy that targets a flow of oil around the hottest areas of the cylinder heads. A new knock sensor for each cylinder enables more-precise timing control. The rear exhaust pipe is repositioned and the exhaust catalyst is relocated to move heat away from the passenger. Idle speed is lowered from 1,000 rpm to 850 rpm. Improved Fit A new, slimmer primary drive cover and the low-profile shape of the air cleaner cover provide improved rider legroom around the engine and an easier reach to the ground for many riders. All Milwaukee-Eight powered models are fitted with an assist and slip clutch with improved hydraulic actuation and 7 percent less clutch lever effort. Reduced Vibration The rubber-mounted Milwaukee-Eight engine features a single internal counter balancer that cancels 75 percent of primary vibration at idle for a more refined feel and more comfortable experience for rider and passengers while retaining the classic character of Harley® V-Twin engines. Richer Exhaust Note Lighter valves, a single camshaft, optimized cover designs and improved driveline components greatly reduce mechanical powertrain noise. The engine intake and air cleaner are designed to reduce intake sound while ensuring maximum air flow. As a result, the new Milwaukee-Eight engine is mechanically quieter, enabling a richer exhaust tone that meets all global noise and emissions standards while allowing the unmistakable rumble of its exhaust note to resonate. Improved Charging The Milwaukee-Eight engine charging system delivers 50 percent more output to the battery at idle to better support the power demands of touring riders, including accessory lighting, performance audio, and heated gear and other accessories. 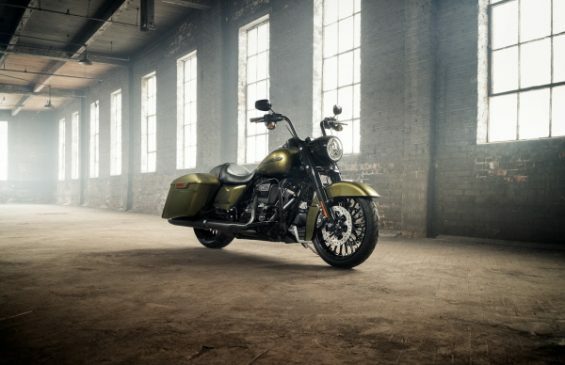 New Engine Styling The Milwaukee-Eight engine features sleek, modern styling that respects the heritage of previous Harley-Davidson big twin engines. 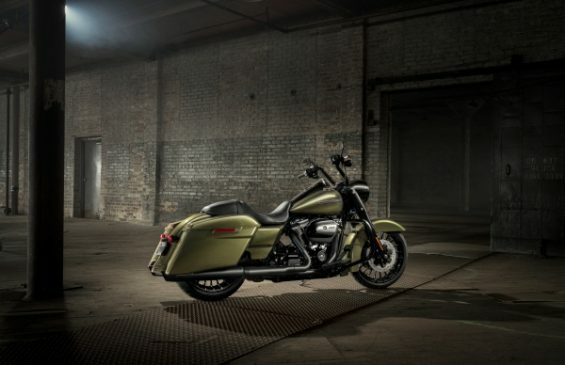 The Road King Special is the first model to feature the Milwaukee-Eight in an all-black engine finish.